LOS ANGELES - Nov. 13, 2015 - PRLog -- With fewer than 10,000 dermatologists in the U.S. serving more than 320 million Americans, getting an appointment to evaluate your skin problem can be challenging. 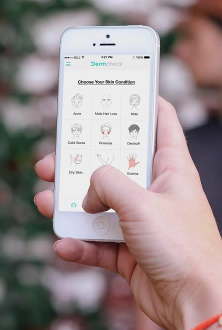 DermCheck, a new app introduced and created by the nation’s leading board-certified dermatologists, offers patients their diagnoses, treatment plans and all necessary prescriptions without having to set foot in a doctor’s office. Users are asked to upload photographs of problem areas to the DermCheck app where they are evaluated by a board-certified dermatologist. Within 24 hours, the patient is counseled, a treatment plan is formulated and prescriptions are written. The app is free and the cost for each evaluation and one month of follow-up and doctor consultation is $39.95. DermCheck resulted from the difficulty and inconvenience that some have in scheduling appointments to see their dermatologist and how delays in having a skin growth or irregularity looked at can pose a serious risk to one’s health. November is National Healthy Skin Month, which encourages people to be proactive about their personal skin care. To help, DermCheck is offering the first evaluation at no cost to California residents. For more information call (310) 315-4989 or visit DermCheckApp.com.